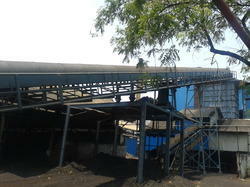 Pioneers in the industry, we offer coal feeding conveyor and feeding conveyor from India. Keeping in mind the precise demands of clients, we offer a qualitative range of Coal Feeding Conveyor. These are used in large assembly lines where the operator has to transfer jobs from one machine to another during sequential operation. These are constructed using quality steel as the raw material and offer high tensile strength, wear & tear resistance and corrosion resistance. We are the leading manufacturer and supplier of Coal Feeding Conveyor in Tamilnadu, Kerala, Coimbatore, Tirupur, Karur, Salem, Chennai etc. Our company also offers Feeding Conveyor as a solution in the material handling equipment. Our range of conveyor is designed and manufactured to give high durability and efficient performance. Our range of conveyors is rich in reliability and thus helps in the reduction of the maintenance and cost of the equipment.